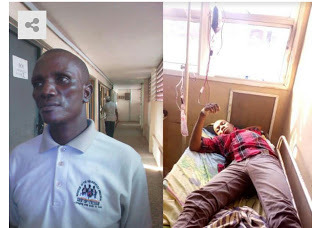 The Lagos State Police Command has uncovered an Illegal Blood Bank in Bariga area of Lagos yesterday, run by a man identified as Paul Achegbulu. The suspect Achegbulu has been arrested. Achegbulu was arrested by a team led by Police Commissioner Imohimi Edgal Tuesday after detectives got information that the suspect was draining blood from children in his one-room apartment and selling same to some clinics. It was gathered that the police team recovered seven pints of blood from his 18, Kusa Bus Stop, Bariga residence. According to residents, trouble started for the suspect on June 10, after he drew two pints of blood from a 17-year-old boy, Ayomide Adesanya, which made the victim to pass out. He was said to have also drawn two pints from the same victim on June 4, and on each day, he gave the victim N2,000. Imohimi, who also visited Adesanya at the hospital he was admitted after he passed out, told reporters that the suspect lured underage children with the N2, 000 offer, while he confessed that he sold the blood for N7, 000. “Adesanya became weak after donating four pints of blood. He collapsed and is currently receiving treatment at the Bariga Hospital. But the suspect said he did not know Adesanya was underage, adding that the victim told him he was 20-year-old. “It was when his parents came to confront me that I knew he was 17. He told me he was 20. I am a lab scientist. I was trained five years ago at Nigerian Institute of Laboratory Science Technology.